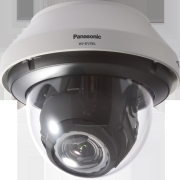 The WV-SFN110 is a Super Dynamic Full HD Dome Network Camera which offers superior durability and built-in mic for audio monitoring. Its compact size enables inconspicuous installation and makes the camera look unnoticeable in any environment. Its wide-angle imaging of up to 108 degrees horizontal view means more area can be covered with less installed cameras compared to conventional cameras. 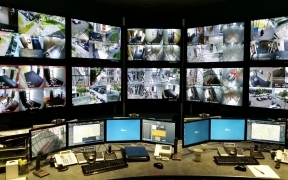 The intelligent i-VMD function makes active and finely detailed alarm detection possible saving bandwidth and storage space. The WV-SFN110 is very well suited for any wide areas like retail, museums and any of the daily sales business places. Appropriate-sized video stream is ensured as the WV-SFN110 camera saves the network bandwidth, sending out up to four H.264 (High profile) streams and JPEG streams sized appropriately for each device requirement. Due to a higher H.264 compression the saves the network bandwidth and the recorder disk space, keeping high quality of images. As a result, the total cost of ownership is lowered within the whole surveillance system as less disk or cloud storage space is needed. Furthermore, the camera features our Smart Coding Technology : Group of Pictures (GOP) control removes unnecessary information from the frame for realizing efficient encoding. With the latest bitrate reducing technology, GOP control, 3D-MNR and FDF, this camera saves network bandwidth and recorder disk space.